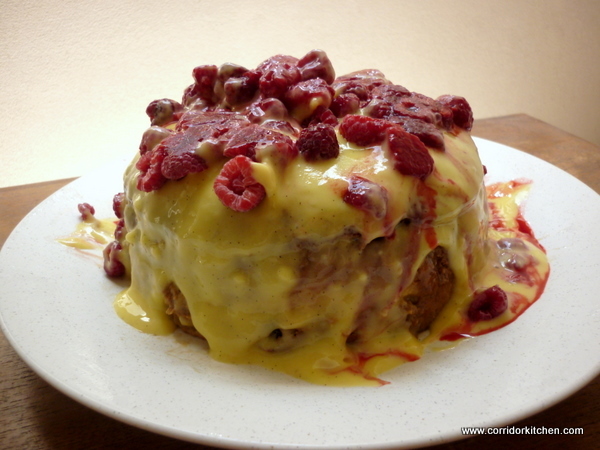 Good idea to introduce coffee and raspberries to cut the sweetness and richness of the panettone-custard combo. Perhaps it doesn’t look like a patisserie dessert but sounds good! i’m glad you shared this! the idea is great – custard, coffee, pannetone, berries? maybe like you suggested, these singly wonderful ingredients weren’t intended to marry. i had a similar experience a few weeks ago. after unintentionally excluding my non-dairy-eating sister-in-law from all my desserts (oops), i pointedly made what i thought would be a beautiful milk- and butter-less lemon blueberry cake. right…. half of it ended up stuck to the pan. it was dry, with soggy berries. it tasted like soy milk and nothing else (big buzzkill). oh well, onward! Do you know what? This is one apparent “disaster” I’d happily tuck into. What a delicious trifle. Great flavours! @ Gaby – Thanks! I think the coffee/panettone combo works. Not so sure about the rest. I’ve had it with blueberries and it was nicer. @ John – Thanks you! I think it needs a little more work. I enjoyed it though. This was delicious! I had strawberries and peaches instead of raspberries, and cut up the panettone into chunks so it looked good in the bowl, still a mess on the plate though, maybe making them up individually in glasses would fancy it up. Also added benedictine to the coffee, yum!